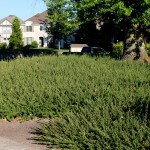 A low spreading groundcover with rounded, leathery, dark green leaves and arching branches. Small blue to purplish flowers appear in the spring in clusters along the branches. Prefers full sun and well-drained soil. Takes drought once established.